The Congressional Budget Office's (CBO) analysis of the President's Fiscal Year (FY) 2019 budget found that the President's policies would still result in debt rising to 86 percent of the economy by 2028 – 13 points higher than the 73 percent estimated by the White House Office of Management and Budget (OMB). The difference is driven by OMB's extremely rosy economic growth projections. CBO agrees with nearly all other economic forecasters that the economy will likely grow around 3 percent over the next two years before falling back down to the long-run trend of less than 2 percent – much lower than OMB's assumption that 3 percent growth will persist for years before falling modestly down to 2.8 percent. [The Joint Committee on Taxation] and CBO’s estimates of revenues differ from the Administration’s largely because of differences in economic forecasts. In particular, CBO projects wages and salaries after 2021 that are between 1 percent and 9 percent lower than the Administration estimates. As a result, CBO projects revenues from individual income and payroll taxes that are lower by $1.2 trillion over the 2019–2028 period. Variations in modeling approaches account for most of the remaining difference. As we've explained before, CBO independently projects economic growth by evaluating short-term conditions and long-term, structural mechanisms. As a result, CBO estimates that the economy will grow by an average of 1.8 percent annually over the next decade, with more rapid growth upfront due to expansionary fiscal policy but slower growth in later years. This is in line with private forecasters, who all generally maintain around 2 percent growth as the economy's long-run rate. These projections are in stark contrast with the Administration, which projects growth averaging 3 percent over the next decade and 2.8 percent in the final year. However, many structural challenges prevent this from being a likely scenario – particularly the aging population – despite recent positive economic news. Importantly, CBO concedes that it does not include macroeconomic estimates of the Administration's policies; however, the policy with the largest effect – the tax law – has been included in CBO's estimates. If CBO were to incorporate a permanent extension of the tax law and the effects of the budget's deficit reduction, it might increase the average annual growth rate by one-twentieth of a percentage point, which would still fall far short of 3 percent. OMB's projection for 3 percent growth in 2018 and 2019 does align with CBO, the Federal Reserve, and private forecasters. But as we showed in Can America Sustain the Recent Economic Boost?, the uptick in growth over the next two years is attributable to the economic recovery and one-time stimulus from deficit-financed tax cuts and spending increases. 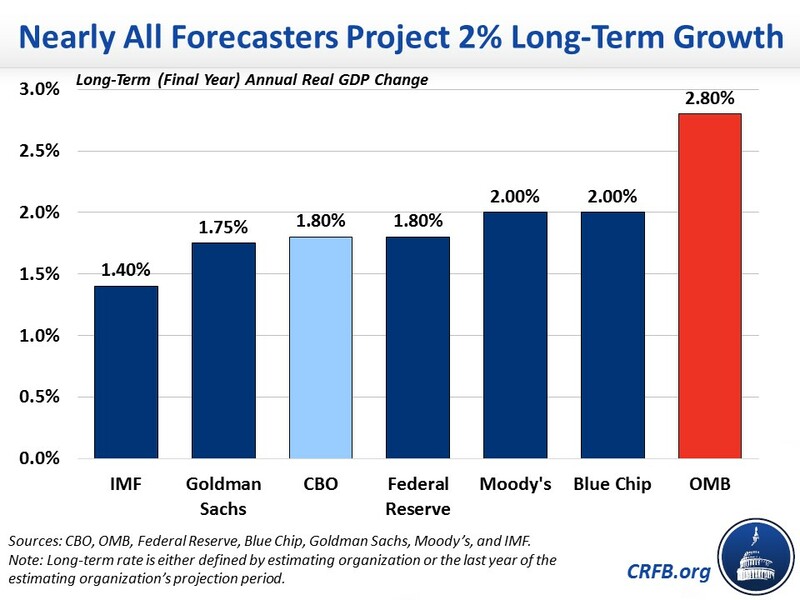 The short-term boost is unlikely to last, as CBO and all the other forecasters show. CBO's analysis and economic projections reiterate the importance of using impartial estimates in the policymaking process. Starting from a realistic set of projections emphasizes the need for pro-growth policies that help put the debt on a downward path.